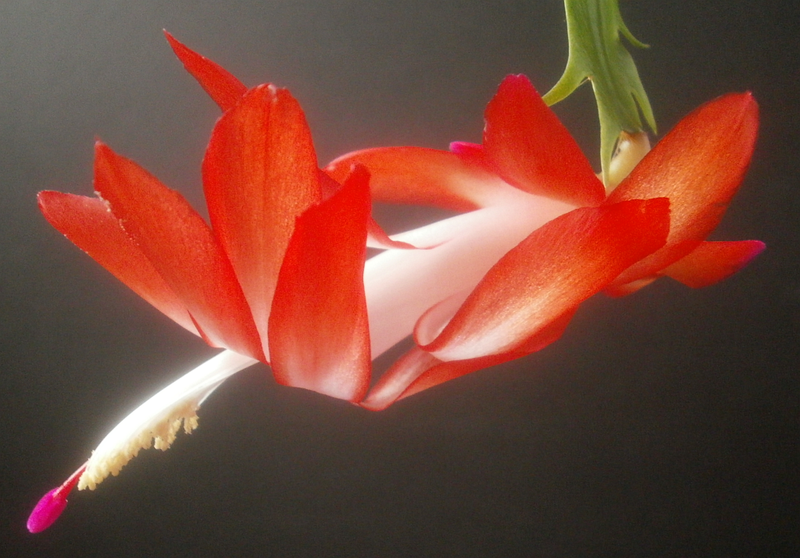 Not an incredibly interesting Schlumbergera seedling. I mean, it's pretty, but we've seen like ten thousand orange Schlumbergeras by this point and it's difficult to get excited about another one. 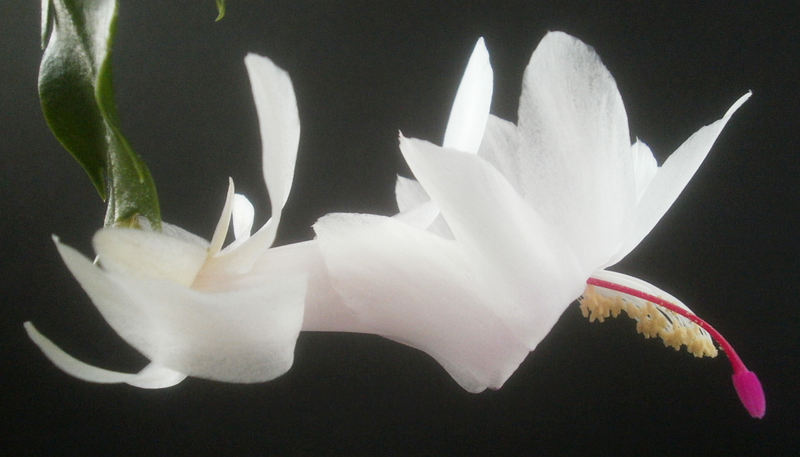 Also it only produced one bloom, from which I got exactly one photo. So we'd best get to naming. I had four name finalists but decided that one was stupid, so I dropped it at the last minute, leaving us with Apollo, Aqua Regia, and Unashamed. Apollo is the Greek and Roman god of music, the sun and light, healing and disease, prophecy and truth, and poetry. I considered the name previously for 089A Halloween Moon and 114A Gallant Fox, and rejected it on the grounds that it wasn't interesting enough and that there's plenty of stuff named for Apollo already, respectively. Aqua Regia is the mixture of nitric and hydrochloric acids mainly used in gold refining. (It has a fancy name because it's been known for a long time.) I considered it previously for seedling 057B Oxomoco, and rejected it on the grounds that 057B was redder than aqua regia normally is (it's usually orange or yellow-orange). Unashamed doesn't come from anywhere in particular, but I guess seemed appropriate for such a strong color. So. Unashamed might be more appealing if I hadn't just named a seedling 165A Assertive. Not that the words are synonyms, but they're sort of related ideas, connected via the idea of directness, not being shy, maybe a little confrontational. The two remaining words both have the problem of being Latin, or Latin-adjacent, which is a no-no for official cultivar naming, but Aqua Regia is much more obviously so than Apollo is. On the other hand, Apollo is much more likely to be in use already; people name things for Apollo all the time.1 And this particular seedling is unlikely to ever be officially registered, which means that the name is just for me and I can call it whatever I want, Latin or not. I considered combining the two names. The most logical combination would be Apollo Rex, but that's already taken (a proposed TV show; a band). So I thought maybe an anagram? The problem with anagrams is that there's a Q involved in "apollo aqua regia," which severely limits the number of ways to use all the letters. However, the anagram site I linked will also, if you ask, give you a list of the words that can be made from the input letters, whether or not the whole set of letters can be rearranged into words or not.2 So I looked at the candidate words for a while, and saw "Oriole," which I've considered as a possible seedling name in the past because they're orange birds.3 "Allure" was also on the list, and I kind of like how difficult "oriole allure" is to say clearly. So forget Apollo, forget Aqua Regia, I'm going with 215A Oriole Allure. 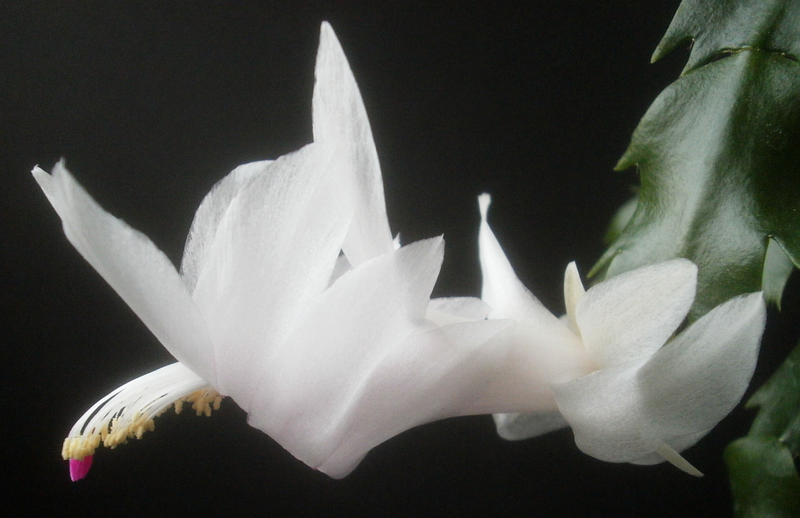 1 To illustrate, check out what the International Orchid Registry comes up with for orchids named "Apollo:"
If there's not already a Schlumbergera 'Apollo,' surely it's only a matter of time. 2 E.g. the longest word that can be made from the letters in "Apollo Aqua Regia" is the nine-letter "paralegal," though there are no full anagrams containing "paralegal" because the letters left over are a, i, o, o, q, & u. 3 Well, orange and black. And usually the orange is substantially yellowish. Though there are species of oriole closer to this seedling's color. Anthurium no. 0915 "Parker MacArthur"
I'll cut to the chase and say in the first sentence that Parker is not a keeper. She has exactly one good quality -- she produces a lot of blooms, and does so despite still being in a 3-inch pot -- and about half a dozen bad qualities. 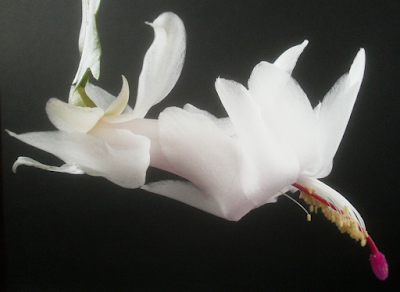 The blooms are uniformly very small, under an inch (2.5 cm) long. 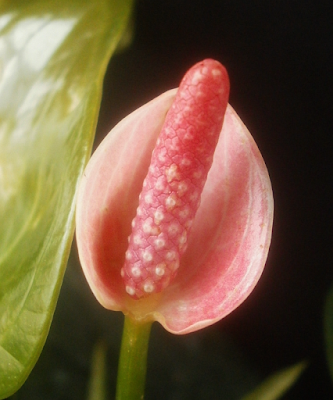 They are a common color combination (pink/pink, like Parker's seed parent, the much larger 0066 Barbara Seville). 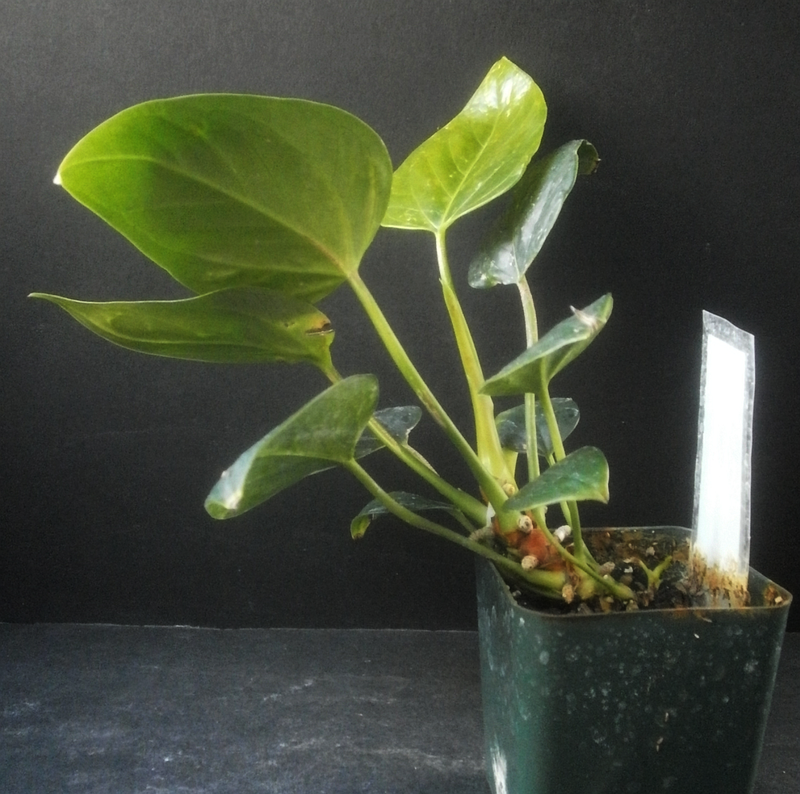 Both spathes and leaves are readily attacked by thrips, and the light spathe color makes any damage really obvious. Although it's not obvious from the (pretty old) full-plant picture below, the internodal distance is also a bit long, making the plant leggy. And none of this is getting better as the plant gets older. I mean, occasionally the seedlings grow out of problems if given enough time to try, but not this one. So Parker's toast whenever I get around to pitching her. One cold hard scientific fact I've learned this year (thanks to reader Pattock) is that in Schlumbergeras, whiteness is recessive. 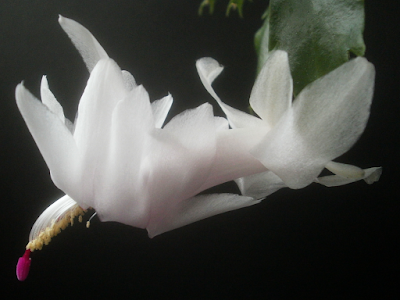 It also seems to be the case that all white Schlumbergeras look pretty much the same.1 So unless you're specifically focused on breeding a bigger, more pest-resistant, more floriferous white Schlumbergera, it's not worth the time and effort to cross a white seedling with a pigmented one. Either the pigmented flower has a recessive white gene, in which case you'll get half pigmented and half white offspring, or it doesn't, in which case all the offspring will look like the pigmented plant. I mean, the logic there might not be 100% sound, but it sure looks like that's the basic situation so far. 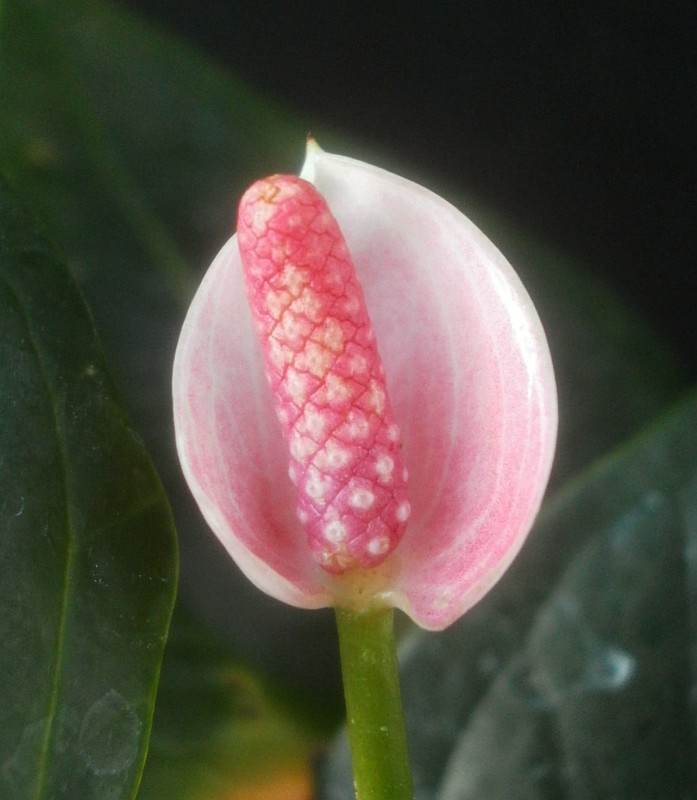 So seedling 193A's seed parent was the NOID magenta, which pretty clearly has a recessive white gene in it. And 193A is a really, really good white, with nicely-shaped, large blooms. It even photographed well for me, which doesn't happen that often with the white seedlings. So I do like it, and it's a keeper, but I don't expect to use it for any breeding. So the first name to go is White Knight, because it's become mildly pejorative in the online world and I'm not that into the whole medieval thing in the first place. Chess either, for that matter. And I do try not to put the color of the flower in the name if I can help it. And Glass Slipper would actually be a pretty good name for some of the white Schlumbergeras, as a lot of them end up looking semi-transparent in photos, but 193A mostly didn't photograph that way, so it seems like it would be more appropriate for one of the four other unnamed white seedlings. And there's nothing wrong with Vapor Trail, but I'm obviously pretty into Arcade Gannon (even if I haven't explained why very well), so this one has to be 193A Arcade Gannon. 1 Some white flowers look better than others, of course. 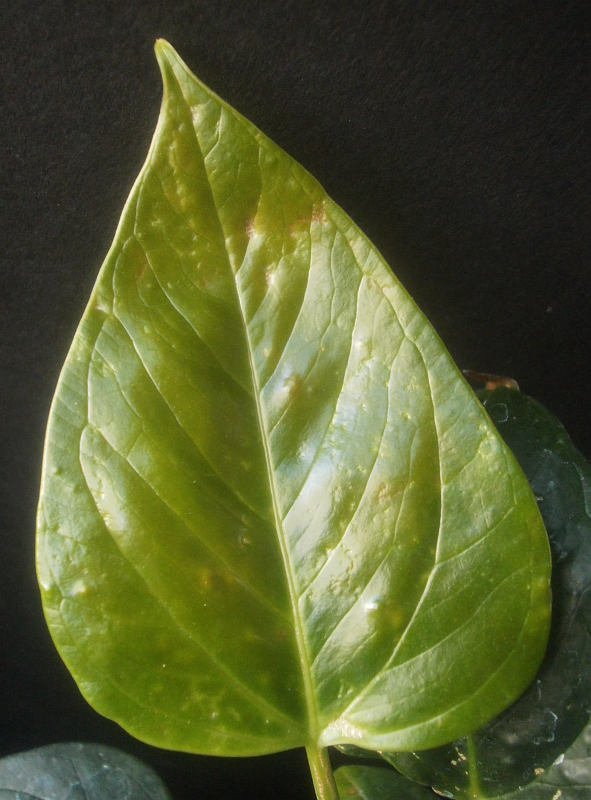 Bigger/smaller flowers, more/less thrips damage, that sort of thing. But as far as the color goes, they're all the same; there's no spectrum of different shades of white to be explored: white is just white. 2 It's not completely unprecedented for me to give a seedling a game-related name, but it's only happened three times before: 067A Clyde (Pac-Man), 072A Chell (Portal / Portal 2) and 107A Nova Prospekt (Half-Life 2). This feels a little weird, and I suppose it's not as classy as a mythological name (013A Tantalus, 057B Oxomoco, 066B Sigrid The Haughty, 077A Grendel), but it's kind of a distinction without a difference: video games are mythology too, like TV (102A Michonne) or movies (090A Lola). So it feels weird, but there's no reason not to do it if I want to, right?